Posted on November 16, 2015 at 10:41 am <https://blogs.nasa.gov/kennedy/2015/11/16/space-grown-flowers-will-be-new-year-blooms-on-international-space-station/> by Linda Herridge <https://blogs.nasa.gov/kennedy/author/lherridg/>. 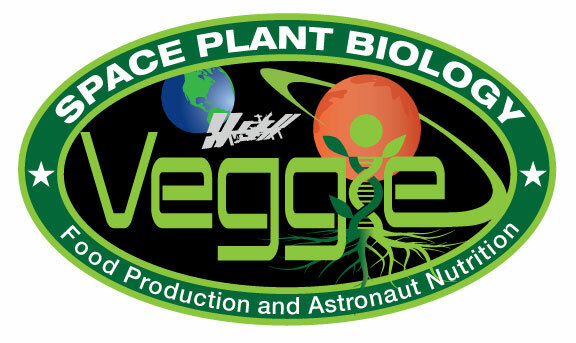 <http://blogs.nasa.gov/kennedy/wp-content/uploads/sites/246/2015/11/Veggie_Patch_final.jpg>Flowers could be blooming on the International Space Station after the New Year. This morning, NASA astronaut Kjell Lindgren activated the Veggie plant growth system and its rooting “pillows” containing Zinnia seeds on the space station.It is the first time that a flowering crop experiment will be grown on the orbiting laboratory. Growing Zinnias in orbit will help provide precursory information about other flowering plants that could be grown in space.“Growing a flowering crop is more challenging than growing a vegetative crop such as lettuce,” said Gioia Massa, NASA Kennedy Space Center payload scientist for Veggie. “Lighting and other environmental parameters are more critical.”Lindgren will turn on the red, blue and green LED lights, activate the water and nutrient system to Veggie, and monitor the plant growth. The Zinnias will grow for 60 days, which is twice as long as the first and second crop of Outredgeous red romaine lettuce that grew on the space station.During the growth cycle, the LED lights will be on for 10 hours and off for 14 hours in order to stimulate the plants to flower.“Growing the Zinnia plants will help advance our knowledge of how plants flower in the Veggie growth system, and will enable fruiting plants like tomatoes to be grown and eaten in space using Veggie as the in-orbit garden,” said Trent Smith, Veggie program manager at Kennedy. Researchers also hope to gather good data regarding long-duration seed stow and germination, whether pollen could be an issue, and the impacts on crew morale. Growing tomato plants on the space station is planned for 2017. The Veggie system was developed by Orbital Technologies Corp. (ORBITEC) in Madison, Wisconsin, and tested at Kennedy before flight. Veggie, along with two sets of pillows containing romaine seeds and one set of zinnias, was delivered to the station by SpaceX on the third cargo resupply mission in April 2014. Astronomers using data from NASA's Fermi Gamma-ray Space Telescope have detected hints of periodic changes in the brightness of a so-called "active" galaxy, whose emissions are powered by a supersized black hole. If confirmed, the discovery would mark the first years-long cyclic gamma-ray emission ever detected from any galaxy, which could provide new insights into physical processes near the black hole. "Looking at many years of data from Fermi's Large Area Telescope (LAT), we picked up indications of a roughly two-year-long variation of gamma rays from a galaxy known as PG 1553+113," said Stefano Ciprini, who coordinates the Fermi team at the Italian Space Agency's Science Data Center (ASDC) in Rome. "This signal is subtle and has been seen over less than four cycles, so while this is tantalizing we need more observations.” Supermassive black holes weighing millions of times the sun's mass lie at the hearts of most large galaxies, including our own Milky Way. In about 1 percent of these galaxies, the monster black hole radiates billions of times as much energy as the sun, emission that can vary unpredictably on timescales ranging from minutes to years. Astronomers refer to these as active galaxies. More than half of the gamma-ray sources seen by Fermi's LAT are active galaxies called blazars, like PG 1553+113. As matter falls toward its supermassive black hole, some subatomic particles escape at nearly the speed of light along a pair of jets pointed in opposite directions. What makes a blazar so bright is that one of these particle jets happens to be aimed almost directly toward us. "In essence, we are looking down the throat of the jet, so how it varies in brightness becomes our primary tool for understanding the structure of the jet and the environment near the black hole," said Sara Cutini, an astrophysicist at ASDC. Motivated by the possibility of regular gamma-ray changes, the researchers examined a decade of multiwavelength data. These included long-term optical observations from Tuorla Observatory in Finland, Lick Observatory in California, and the Catalina Sky Survey near Tucson, Arizona, as well as optical and X-ray data from NASA's Swift spacecraft. The team also studied observations from the Owens Valley Radio Observatory near Bishop, California, which has observed PG 1553+113 every few weeks since 2008 as part of an ongoing blazar monitoring program in support of the Fermi mission. 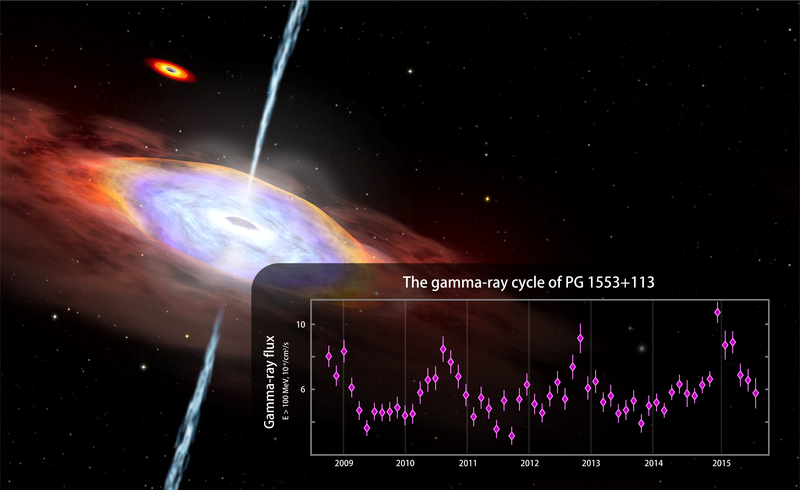 Fermi observations suggest possible years-long cyclic changes in gamma-ray emission from the blazar PG 1553+113. The graph shows Fermi Large Area Telescope data from August 2008 to July 2015 for gamma rays with energies above 100 million electron volts (MeV). For comparison, visible light ranges between 2 and 3 electron volts. Vertical lines on data points are error bars. Background: One possible explanation for the gamma-ray cycle is an oscillation of the jet produced by the gravitational pull of a second massive black hole, seen at top left in this artist's rendering. "The cyclic variations in visible light and radio waves are similar to what we see in high-energy gamma-rays from Fermi," said Stefan Larsson, a researcher at the Royal Institute of Technology in Stockholm and a long-time collaborator with the ASDC team. "The fact that the pattern is so consistent across such a wide range of wavelengths is an indication that the periodicity is real and not just a fluctuation seen in the gamma-ray data.” Ciprini, Cutini, Larsson and their colleagues published the findings <http://iopscience.iop.org/article/10.1088/2041-8205/813/2/L41> in the Nov. 10 edition of The Astrophysical Journal Letters. If the gamma-ray cycle of PG 1553+113 is in fact real, they predict it will peak again in 2017 and 2019, well within Fermi's expected operational lifetime. The scientists identified several scenarios that could drive periodic emission, including different mechanisms that could produce a years-long wobble in the jet of high-energy particles emanating from the black hole. The most exciting scenario involves the presence of a second supermassive black hole closely orbiting the one producing the jet we observe. The gravitational pull of the neighboring black hole would periodically tilt the inner part of its companion's accretion disk, where gas falling toward the black hole accumulates and heats up. The result would be a slow oscillation of the jet much like that of a lawn sprinkler, which could produce the cyclic gamma-ray changes we observe. PG 1553+113 lies in the direction of the constellation Serpens, and its light takes about 5 billion years to reach Earth. NASA's Fermi Gamma-ray Space Telescope was launched in June 2008. The mission is an astrophysics and particle physics partnership, developed in collaboration with the U.S. Department of Energy and with important contributions from academic institutions and partners in France, Germany, Italy, Japan, Sweden and the United States. NASA's Swift satellite detected a rising tide of high-energy X-rays from the constellation Cygnus on June 15, just before 2:32 p.m. EDT. About 10 minutes later, the Japanese experiment on the International Space Station called the Monitor of All-sky X-ray Image (MAXI) also picked up the flare. The outburst came from V404 Cygni, a binary system located about 8,000 light-years away that contains a black hole. Every couple of decades the black hole fires up in an outburst of high-energy light, becoming an X-ray nova. Until the Swift detection, it had been slumbering since 1989. On June 15, NASA's Swift caught the onset of a rare X-ray outburst from a stellar-mass black hole in the binary system V404 Cygni. Astronomers around the world are watching the event. In this system, illustrated in this animation, a stream of gas from a star much like the sun flows toward a 10 solar mass black hole. Instead of spiraling toward the black hole, the gas accumulates in an accretion disk around it. Every couple of decades, the disk switches into a state that sends the gas rushing inward, starting a new outburst. An X-ray nova is a bright, short-lived X-ray source that reaches peak intensity in a few days and then fades out over a period of weeks or months. The outburst occurs when stored gas abruptly rushes toward a neutron star or black hole. By studying the patterns of the X-rays produced, astronomers can determine the kind of object at the heart of the eruption. "Relative to the lifetime of space observatories, these black hole eruptions are quite rare," said Neil Gehrels, Swift's principal investigator at NASA's Goddard Space Flight Center in Greenbelt, Maryland. "So when we see one of them flare up, we try to throw everything we have at it, monitoring across the spectrum, from radio waves to gamma rays.” Astronomers classify this type of system as a low-mass X-ray binary. In V404 Cygni, a star slightly smaller than the sun orbits a black hole 10 times its mass in only 6.5 days. The close orbit and strong gravity of the black hole produce tidal forces that pull a stream of gas from its partner. The gas travels to a storage disk around the black hole and heats up to millions of degrees, producing a steady stream of X-rays as it falls inward. But the disk flips between two dramatically different conditions. In its cooler state, the gas resists inward flow and just collects in the outer part of the disk like water behind a dam. Inevitably the build-up of gas overwhelms the dam, and a tsunami of hot bright gas rushes toward the black hole. Astronomers relish the opportunity to collect simultaneous multiwavelength data on black hole binaries, especially one as close as V404 Cygni. In 1938 and 1956, astronomers caught V404 Cygni undergoing outbursts in visible light. During its eruption in 1989, the system was observed by Ginga, an X-ray satellite operated by Japan, and instruments aboard Russia's Mir space station "Right now, V404 Cygni shows exceptional variation at all wavelengths, offering us a rare chance to add to this unique data set," said Eleonora Troja, a Swift team member at Goddard. Ongoing or planned satellite observations of the outburst involve NASA’s Swift satellite, Chandra X-ray Observatory and Fermi Gamma-ray Space Telescope, as well as Japan’s MAXI, the European Space Agency's INTEGRAL satellite, and the Italian Space Agency's AGILE gamma-ray mission. Ground-based facilities following the eruption include the 10.4-meter Gran Telescopio Canarias operated by Spain in the Canary Islands, the University of Leicester's 0.5-meter telescope in Oadby, U.K., the Nasu radio telescope at Waseda University in Japan, and amateur observatories. V404 Cygni has flared many times since the eruption began, with activity ranging from minutes to hours. "It repeatedly becomes the brightest object in the X-ray sky -- up to 50 times brighter than the Crab Nebula, which is normally one of the brightest sources," said Erik Kuulkers, the INTEGRAL project scientist at ESA's European Space Astronomy Centre in Madrid. "It is definitely a 'once in a professional lifetime' opportunity.” In a single week, flares from V404 Cygni generated more than 70 "triggers" of the Gamma-ray Burst Monitor (GBM) aboard Fermi. This is more than five times the number of triggers seen from all objects in the sky in a typical week. The GBM triggers when it detects a gamma-ray flare, then it sends numerous emails containing increasingly refined information about the event to scientists on duty. Every time the GBM recovered from one trigger, V404 Cygni set it off again, resulting in a torrent of emails. The event prompted David Yu, a GBM scientist at the Max Planck Institute of Extraterrestrial Physics in Garching, Germany, to comment on social media: "Achievement Unlocked: Mailbox spammed by a blackhole."